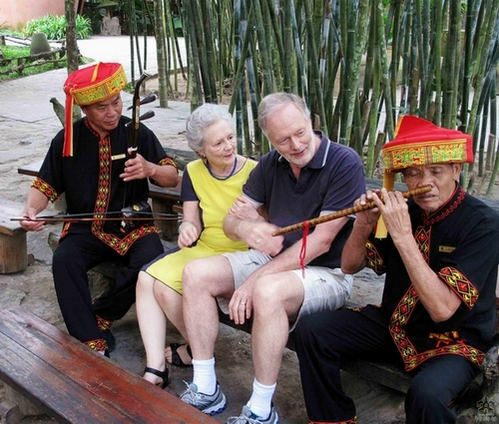 The two BBC hosts, Acem and Oaten are enjoying the bamboo dance and traditional nose flute music by Li people. A camera crew from the BBC, one of the world’s largest broadcasters, headed to Binglanggu Valley to shoot a documentary film showcasing Sanya’s landscape and culture on March 25, 2013. Approved by the Sanya government, the program is aiming to help develop an international tourist image of ‘forever tropical paradise’ and promote it in overseas markets. 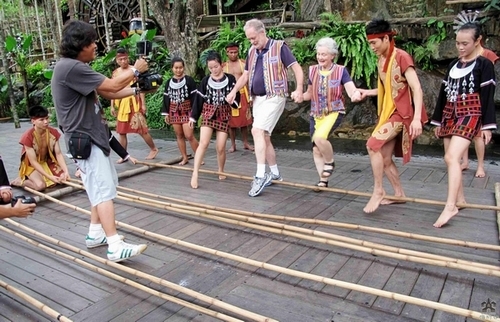 They will present to the British audience the beautiful scenery of Binglanggu Valley and the unique charm of traditional Hainan Li and Miao ethnic cultures including the Li brocade, bamboo dancing and unique Li green cuisines. During the film, the crew also captured the large-scale original and ecological Li and Miao dancing performance ‘Binglang Rhyme’, which has been listed as one of the 2012-2013 key national cultural exports. The documentary is scheduled to be released on BBC channels for 2 consecutive years.